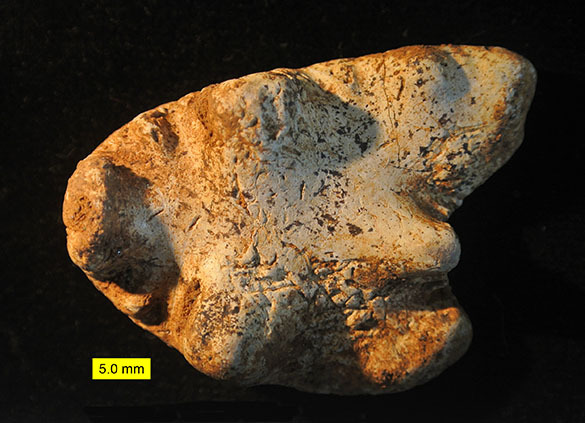 The last two editions were about a bryozoan and borings from the Faringdon Sponge Gravels (Lower Cretaceous, Upper Aptian) of south-central England. This week we have some Jurassic fossils from the same unit. That sounds a bit daft at first — Jurassic fossils in a Cretaceous unit? — until it becomes obvious that these are older fossils reworked into a younger deposit. In this case underlying Jurassic ammonites have been unearthed and tossed around with sediment in Cretaceous high-energy tidal channels. These older fossils in a younger context are called remanié, meaning they have been “rehandled” in a fancy French way. The above image is an example of remanié in the Faringdon Sponge Gravels. 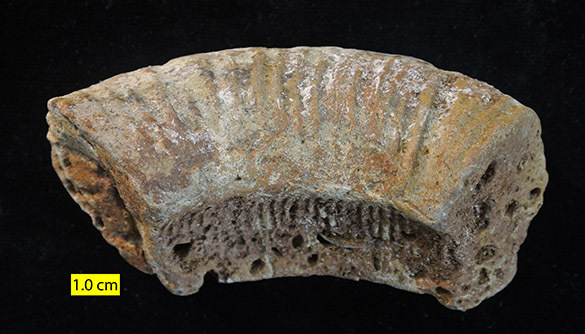 It is a partial internal mold of a Jurassic ammonite. Drilled into it are several holes attributed to Early Cretaceous bivalves and called by the trace fossil name Gastrochaenolites. The ammonite fossil was eroded out of an outcrop of Jurassic rock and then bored while rolling around in what would become the Faringdon Sponge Gravels. This is another Jurassic ammonite internal mold. The jagged lines are the sutures of the ammonite (remnants of the septal walls). This mold was phosphatized (partially replaced with phosphate) before it was reworked into the Cretaceous gravels. Many remanié fossils are phosphatized because of long exposure on the seafloor. Finally, this is a fragment of another Jurassic ammonite internal mold in the Faringdon Sponge Gravels. It has an odd shape because it has disarticulated along the sutures. We are looking at the face of one of the septa, or at least where this septum would have been if it hadn’t dissolved. You can see some tiny borings that were made by Cretaceous polychaete worms. In one of the cobbles in the Faringdon Sponge Gravels I found an identifiable ammonite. It was Prorasenia bowerbanki, which indicated that the cobble was derived from the Lower Kimmeridge Clay or Upper Oxfordian clays. The above ammonites are likely from the same Jurassic sequence. 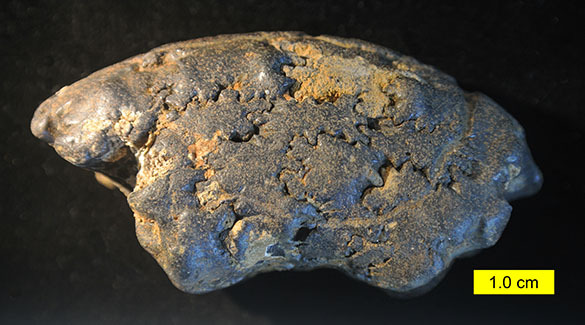 This means these fossils were roughly 45 million years old when they were reworked into the sponge gravels. Today it would be as if Eocene fossils were eroding out of a cliff and being incorporated within a modern sediment. When you think about it, this is a relatively common occurrence. Murray-Wallace, C V. and Belperio, A.P. 1994. Identification of remanié fossils using amino acid racemisation. Alcheringa 18: 219-227. Pitt L.J. and Taylor P.D. 1990. Cretaceous Bryozoa from the Faringdon Sponge Gravel (Aptian) of Oxfordshire. Bulletin of the British Museum (Natural History), Geology Series, 46: 61–152. Wells, M.R., Allison, P.A., Piggott, M.D., Hampson, G.J., Pain, C.C. and Gorman, G.J. 2010. Tidal modeling of an ancient tide-dominated seaway, part 2: the Aptian Lower Greensand Seaway of Northwest Europe. Journal of Sedimentary Research 80: 411-439.